My three loves are football, fashion and fitness. I’m super excited that the premier league season kicks off this weekend after an amazing World Cup as I regularly go to the Emirates to see my team, Arsenal, play. 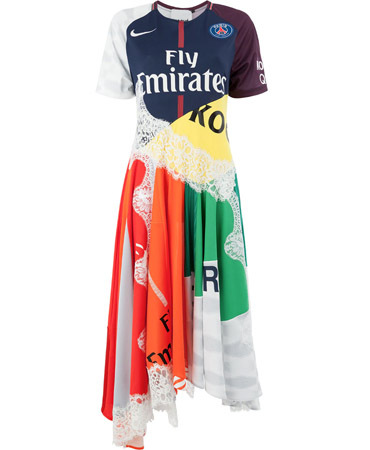 The one thing I have always wanted as a female football fan, is a customized, more feminine football jersey. It looks like Koché is just the designer to make my dreams come true, as she created this Spring 2018 dress as worn by Rita Ora earlier today (August 6), as she was spotted leaving BBC Radio One studios in London. 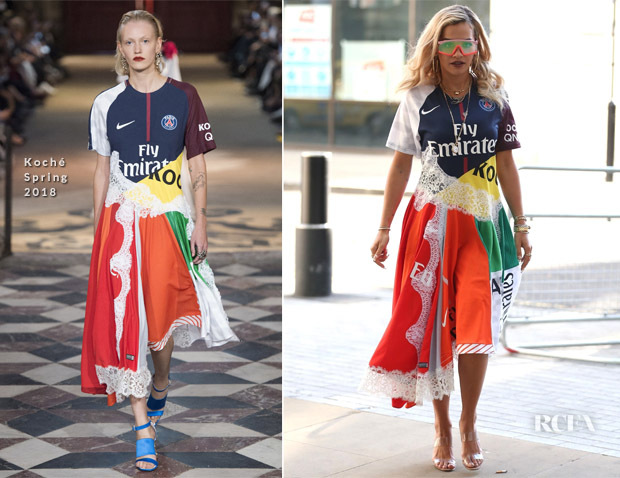 The reworked Paris Saint Germain’s jersey spliced with lace for a more feminine take was styled with Kenzo’s Spring 2019 sunglasses and perspex heels which is becoming a huge trend this summer. It’s one summer trend I find baffling – along with velvet – considering this heatwave. What a strange way to actively encourage sweaty feet. You may remember that Beyonce Knowles was spotted donning a crystal-embellished top from this same collection last month.